Blogging late today… today was not only kiddos last day of school, but also Annabelle’s first day of Physical Therapy/Occupational Therapy/Feeding Therapy on the same day. I have some kinks to work out… but only having one trip to Nashville for weekly therapy is NICE. Just makes for a SUPER busy day! But enough of that, ’cause this momma has to brag on her super awesome no-longer-a-fifth-grader!!! 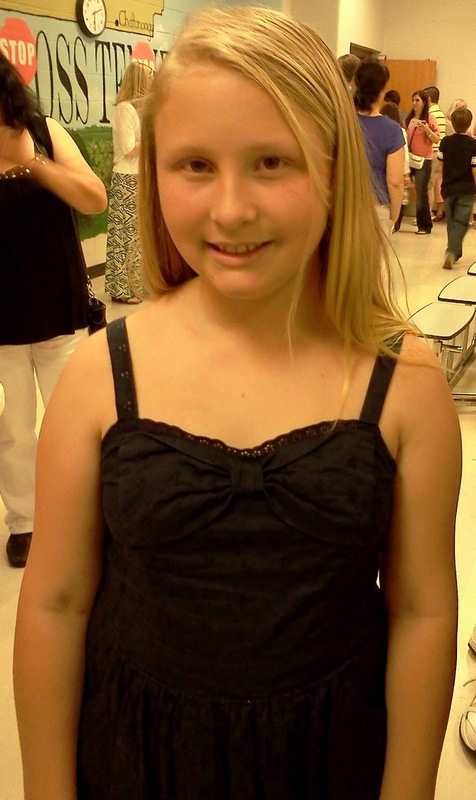 Yesterday was 5th grade graduation for my Karalynn!! And the one I’m MOST proud of, the Citizenship Award! This was given out to one girl and one boy from each class for being outstanding school citizens, exemplifying good character, etc. 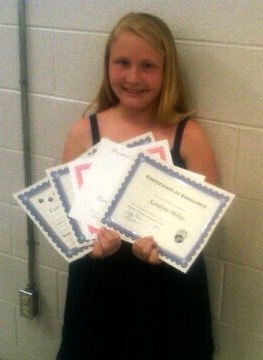 Yeah, I could not be prouder of my now 6th grader!!!! I refrained. Mostly. Although that could be because Annabelle decided to puke all over herself/me/her stroller during the ceremony… otherwise I totally would have been that Momma! In all seriousness, I could not be prouder. The good grades are important, however it really is that last award that made me want to cry. I’ve always tried to stress to my girls the value in being kind to others. Smarts are great, and I know we all want to “look” our best, but I see my daughter living out her faith in Jesus at school and with her friends, and THAT is what I value and celebrate the most today for Karalynn. CONGRATULATIONS KARALYNN……YOUR PARENTS ARE BEAMING WITH JOY OVER THEIR DAUGHTER'S SUCCESS IN SCHOOL AND CARRYING JESUS IS THE BEST PART OF ALL!! GOD GAVE YOU AWESOME PARENTS AND THEY COULDN'T BE MORE PROUDER OF YOU AND YOUR OTHER SISTER'S!! CONGRATS AND GO WITH JOY TO MIDDLE SCHOOL, YOU HAVE A LOT OF ACCOMPLISHMENTS AND YOU ARE A SHINING EXAMPLE OF GREAT PARENTS WHO SHOWED YOU THE LOVE AND COMPASSIOPN IN LIFE!! Keep up the great work Karalynn! You are an amazing girl and a wonderful big sister. Great tribute to your little SmartyPants. Good job, Karalynn!